Rio de Janeiro 2007 Pan American Games. The 2007 Pan American Games, officially known as the XV Pan American Games, were a major International Federations (IFs). Rio de Janeiro was awarded the Games over Federal, State and Municipal— made this edition the best Pan American Games in history. 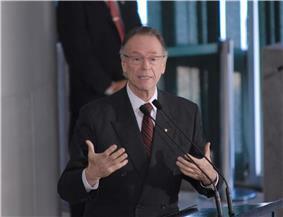 Carlos Arthur Nuzman, chairman of the Rio de Janeiro bid for the 2007 Pan American Games. The official bid was submitted in August 2001 during the XXXIX Santo Domingo, Dominican Republic. In April 2002, following delivery of Federal, State and City Government and BOC letters confirming country, state, city and Brazilian sport compliance with the applicable Games regulations, PASO announced the approval of Rio de Janeiro’s bid. The Bidding Committee then submitted a detailed bid file for the Games. The document was prepared and developed with the assistance of Fundação Getúlio Vargas (FGV), which had been commissioned by Rio de Janeiro's City Government. In the running to host the 2007 Pan American Games, Rio de Janeiro faced off with the city of San Antonio, United States; which previously beat Houston, Miami, and Raleigh to become the American candidate. According to PASO statute and regulations, the host city was selected by direct voting during the XL PASO General Assembly held in Mexico City, Mexico, on August 24, 2002. The candidate city that received the simple majority of votes from representatives of the 42 member National Olympic Committees (NOCs) would be awarded the right to host the competition. The announcement was made by PASO President Mario Vázquez Raña. Rio de Janeiro received 30 votes against 21 from San Antonio. Marked by a professional strategy that included the showing of city and project videos, Rio de Janeiro's campaign convinced the majority of voters, accounting for a total 51 votes. The 39-member Brazilian delegation erupted into boisterous celebration celebrating the country's highest achievement in terms of sporting event organization. August 24, 2002, in Mexico City, Mexico. The organization of the Rio 2007 Games has chosen the figure of the Sun to represent the event. And, in a decision never taken before, it has defined it as the single mascot of the Pan American and Parapan American Games, reinforcing thus the principles against prejudice and that, like the sun, sport is for all. The character reflects the characteristics of the host city and harmonizes with the graphic work developed for the logo and the visual identity of both Games. The name was chosen through popular voting by Internet, cellular phone messages and public ballot boxes placed around the main Brazilian cities, causing great commotion. Over 1.2 million people participated in the election, and the name Cauê received almost half of the votes. Traditionally used in large sport events, the mascot figure serves the purpose of cheering the event, enforcing the ludic aspect of sports and captivating spectators and athletes. The mascot's main choice is to transmit messages of peace, respect to the environment, friendship and brotherhood, which are intrinsic values to the Olympic Movement. The Opening ceremony. Fireworks forming the number 15, of fifteen editions of the games in Roman numerals. 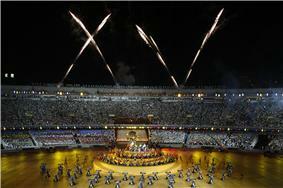 The Opening Ceremony of the XV Pan American Games took place on July 13, 2007. Approximately 90,000 people packed Rio de Janeiro's Maracanã Stadium for the occasion. The ceremony included a cast of 7,000 and a multi-million dollar budget, being produced by Scott Givens. Over 800 people were part of the creative and production teams working on the Opening Ceremony, Team Welcome Ceremonies, Sports Production, the presentation of 2,252 medals, Sports Production, the Closing Ceremony and ParaPan ceremonies. The show began at 05:30 pm (local time, UTC-3) and lasted for two and a half hours. The theme of the show was based on the theme of the Rio 2007 Games: Viva Essa Energia (Share the Energy) and the oath of the athletes was performed by Brazilian Taekwondo athlete Natália Falavigna. Also, a very abbreviated version of the Olympic Anthem was played. Contrary to plan, the games were not opened by Brazil's head of state, President Luiz Inácio Lula da Silva, but by the head of the Brazilian Olympic Committee, Carlos Nuzman. Prior to the official opening, Lula had been constantly booed whenever the in-stadium camera showed his image or when his name was mentioned. The competitions were carried through in a ray of 25 km, spread for four polar regions in the city. City of Sports Complex – Basketball, Cycling (track), Artistic Gymnastics, Swimming, Synchronized Swimming, Roller Skating (Speed and Diving). Outeiro Hill – Cycling (Mountain Bike and BMX). Riocentro Complex (IBC/MPC) – Badminton, Boxing, Fencing, Futsal, Rhythmic Gymnastics and Trampoline, Handball, Judo, Weightlifting, Wrestling, Taekwondo and Table Tennis. City of Rock – Baseball and Softball. Barra Bowling Center – Bowling. Zico Football Center (CFZ) – Football (soccer). Miécimo da Silva Complex – Football (soccer), Karate, Roller Skating (Artistics) and Squash. Deodoro Military Club – Equestrian (Dressage, Eventing, Jumping), Field Hockey, Modern Pentathlon, Sport Shooting and Archery. João Havelange Stadium – Athletics and Football (soccer). Maracanã Stadium – Football (soccer), Water Polo and Volleyball. Marina da Glória – Sailing. Flamengo Park – Athletics (Marathon and Race Walking) and Cycling (road). Copacabana Arena – Swimming Marathon, Triathlon and Beach Volleyball. Rowing Stadium of the Lagoon – Canoe flatwater and Rowing. Caiçaras Club – Water Ski. Main construction work of the 2007 Pan American Games, the João Havelange Olympic Stadium hosted the athletics and football competitions. The stadium is one of the major Games' legacies to the city of Rio de Janeiro, which can since then count on a modern stadium with full capacity to be used for sports and cultural events. The City of Sports Complex counts on modern constructions such as the Rio Olympic Arena, where the Games' basketball and artistic gymnastics competitions were held; the Maria Lenk Aquatic Park, venue for the swimming, synchronized swimming and diving competitions; and the Barra Velodrome, where the cycling (track) and speed skating events took place. Riocentro Convention Center is the largest expositions and fairs center of Latin America, for the 2007 Games, the complex held temporary facilities for staging several sport disciplines, including in the Parapan American Games. The Miécimo da Silva Sports Complex is the largest sports complex that is owned by a City Government (City Hall) in Brazil. Several large sports events took place at this venue, such as the basketball exhibition game between the teams of American Magic Johnson and Brazilian Oscar Schmidt, in addition to several matches of the Brazilian Futsal team. The Deodoro Military Club is a traditional Brazilian Army sport facility in Rio de Janeiro, will host the Rio 2007 Games equestrian, field hockey, modern pentathlon, sport shooting and archery competitions. The Maracanã Stadium was built for the 1950 FIFA World Cup, the Mario Filho Stadium (internationally known as Maracanã) is one of the most famous stadiums in the world, receiving a great number of Brazilian and foreign tourists annually. The stadium staged the Opening and Closing Ceremonies and football matches, including the finals. The Maracanãzinho Gymnasium is the house of the Rio 2007 volleyball competitions. The Julio Delamare Water Park is the stage for the water polo tournament in the Games. The Maracanã Sports Complex also includes the Celio de Barros Athletics Stadium, and it is administered by the Rio de Janeiro State Government. Also known as Aterro do Flamengo, the Flamengo Park is the largest leisure area of the city. Besides Marina da Glória, the main venue for the Rio 2007 sailing competitions. During the Games, the marathon (men’s and women’s) arrival points set up at the Flamengo Park, which will also stage the race walking and cycling road competitions. For the 2007 Games Futsal was added to the program for the first (and as of 2011 only time) while racquetball and basque pelota were dropped. ^ "Mascot of the Games". Rio 2007 Games official website. Archived from the original on 11 August 2007. Retrieved 2007-07-29. ^ "Cerimônia de abertura para ficar na história". Gazeta Esportiva. Archived from the original on 2007-09-27. Retrieved 2007-07-18. ^ "Pan American Games open with extravaganza in Rio". Star Publications. Retrieved 2009-11-25. ^ "Venues". Rio 2007 Games official website. Archived from the original on 15 July 2007. Retrieved 2007-07-29. ^ "João Havelange Stadium". Rio 2007 Games official website. Archived from the original on 21 August 2007. Retrieved 2007-07-29. ^ "City of Sports Complex". Rio 2007 Games official website. Archived from the original on 11 August 2007. Retrieved 2007-07-29. ^ "Riocentro Complex (IBC/MPC)". Rio 2007 Games official website. Archived from the original on 20 August 2007. Retrieved 2007-07-29. ^ "Miécimo da Silva Complex". Rio 2007 Games official website. Retrieved 2007-07-29. ^ "Deodoro Military Club". Rio 2007 Games official website. Archived from the original on 20 August 2007. Retrieved 2007-07-29. ^ "Maracanã Stadium". Rio 2007 Games official website. Archived from the original on 18 August 2007. Retrieved 2007-07-29. ^ "Flamengo Park". Rio 2007 Games official website. Archived from the original on 11 August 2007. Retrieved 2007-07-29. ^ h (2007-07-13). "Deportes - Luciana Aymar y Vanderlei Cordeiro de Lima, figuras ilustres en el desfile". ADN.es. Retrieved 2011-05-20.